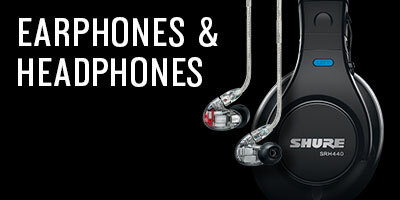 Commanding a strong worldwide presence in the audio industry, Shure stands front and center on the global stage with a passionate devotion to their lines of microphones, wireless systems, headphones, and accessories. Known for their durability, versatility, and performance, you would be incredibly hard-pressed to find a performance venue or professional recording studio without Shure microphones and audio systems in their setup. Built to last, Shure products have all been painstakingly engineered, tested, and implemented in countless applications for over 90 years, meaning you'll be sure to capture the best audio, showcase your musical abilities, and truly breathe life into your sound! 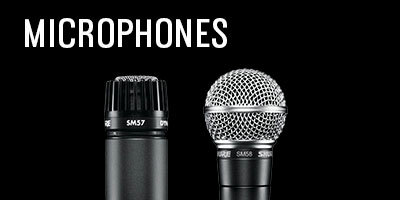 American Musical Supply is excited to be your stop for Shure microphones, wireless, and accessories! We offer True 0% interest payment plans – applying is easy and there is no credit check for our 3-pay plan on purchases from $49-1,500. Use your own debit or credit card, enjoy fast and free shipping, and add Shure products to your creative setup. Vocalists and instrumentalists of all types: Shure microphones bring out your absolute best in either a recording or live setting. If you're looking to cut the cord and free up your performances, Shure wireless microphone systems and in-ear monitors are reliable, easy-to-use solutions. We make buying Shure products quick and easy – in-stock items that are ordered before 4PM EST will ship out the same day! 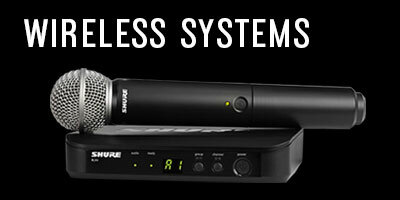 Do you have questions about Shure gear and which items would be best for you? Call our Gear Experts at 800-319-9043 for expert advice.